Spotting a tiger in the wild is a bucket-list thing. Every avid traveller, explorer and lover of nature has wanted to see one at some point of his/her life. And what better place to go tiger-spotting than India! With a count of 2,226 of these majestic big cats, India is home to almost 70% of world’s total tiger population. However, the tally has not been this astounding always. Merely a decade ago, the species were battling the threat of extinction in India. Tiger population had fallen as low as 1,411 in 2006. Thanks to the efforts of NTCA (National Tiger Conservation Authority) and Project Tiger, the numbers shot up gradually. 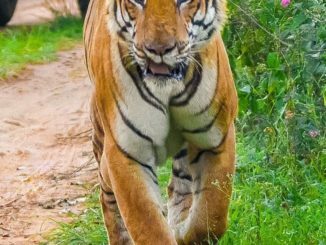 To achieve its ambition of raising tiger population, NTCA added a number of Tiger Reserves to already existing areas for wildlife conservation. The tiger count in these reserves is considerably high and so is the possibility of spotting this magnificent beast. Below is the list of Tiger Reserves India where we think has the best possibility (not in the same order though) to spot a tiger in India among the 50 tigers reserves in India. Corbett became the first National Park to be established in mainland Asia in 1936. The park is named after James Edward Corbett, renowned hunter who turned conservationist. The area came became part of ‘Project Tiger’ in 1971. This was the year that Govt. of India launched its pioneering project to conserve tigers. The reserve spreads over 1,288 square kilometres. This includes 521 square kilometres of JimCorbett National Park at its core. The neighbouring Sonanandi Wildlife Sanctuary and forest areas make up for the remaining of the reserve. 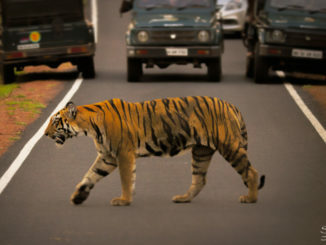 The most famous of Corbett’s residents is the Royal Bengal Tiger. This tiger reserve has pride of having the highest of their density. You can take up a Jeep Safari through the rugged landscape of Corbett national park to spot some of these majestic cats. These safaris are organized by the national sanctuary. Professionals employed are trained to serve the visitors best. 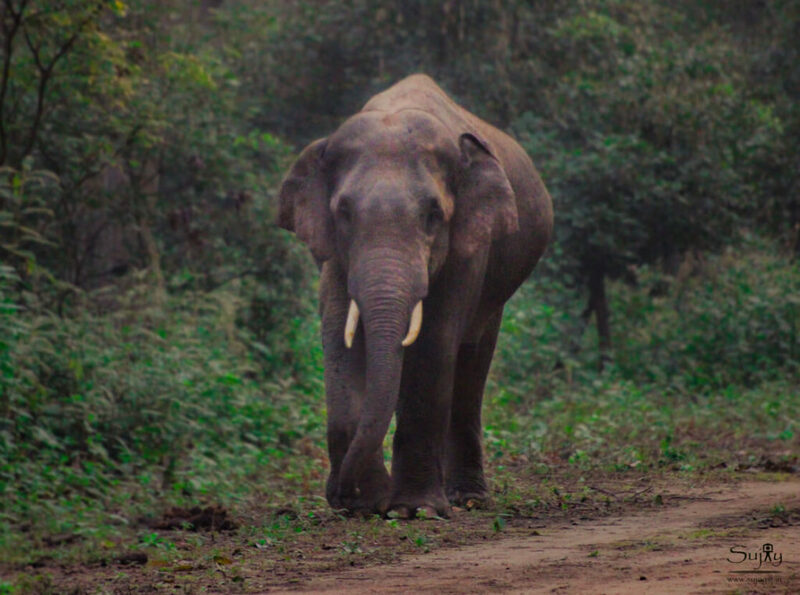 In addition to Royal Bengal Tigers, Corbett national park is also popular for its Asiatic Elephants. Birdlife International has marked the place an ‘Important Bird Area’. It is one of the richest bird regions in the country. Various wildlife species representing mountain and plain ecosystems are also found. 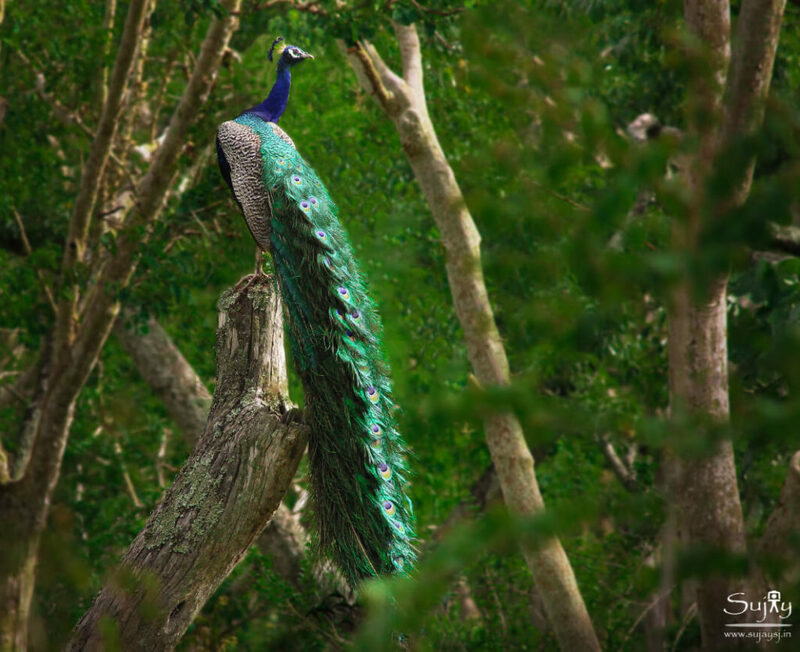 Situated at the tri-junction area of Karnataka, Tamil Nadu and Kerala, this National Park was formed as Venugopala Wildlife Park in 1941. The park was then extended and renamed as ‘Bandipur National Park’ in 1985. In 1973, the Park area was brought under Project Tiger. Presently, an area of 912 square kilometres falls under the reserve. The park has been divided into Eco-Sensitive and Buffer zones by the Govt. The Buffer Zone consists of 118 villages of Mysore and Chamrajnagar districts. It mainly consists of forests areas spread over about 118 sq. km. The Eco Sensitive Zone covers 123 villages and includes the Critical Tiger Habitat of the reserve. 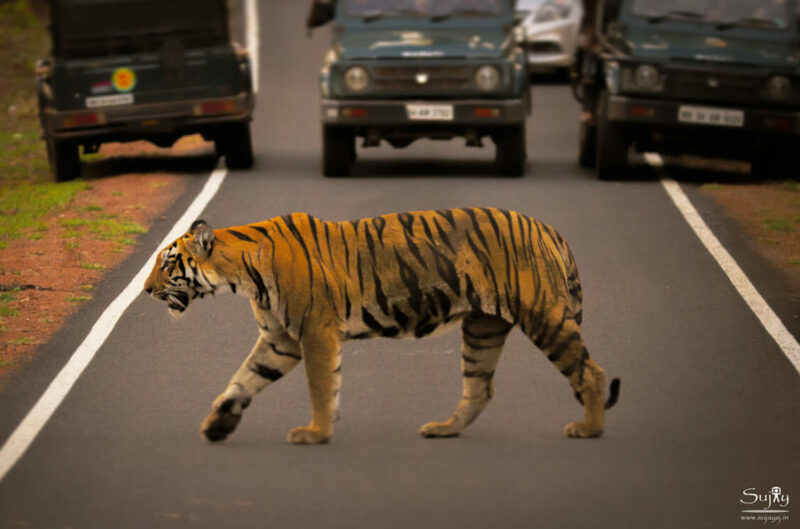 The Bandipur Reserve is part of the Western Ghat’s tiger conservation landscape. This landscape holds 1/8th of the world’s overall tiger population and India’s 1/4th. The tiger count of this zone stands at about 534. Unsurprisingly, the biggest attraction of this place is the safari organized every morning and evening. Both van and jeep safaris can be availed here. You can get your tickets for the same issue at the Bandipur Safari reception Office, located about 5 km from the tiger reserve gate. Barring advance bookings, the Jeep Safari is offered only on a first come first serve basis. Tigers aside, the reserve is home to multifarious endangered and vulnerable species. One can spot Indian elephants, rock pythons, sloth bears and several others. There are over 200 species of birds and significant numbers of butterflies, ants and beetle species. 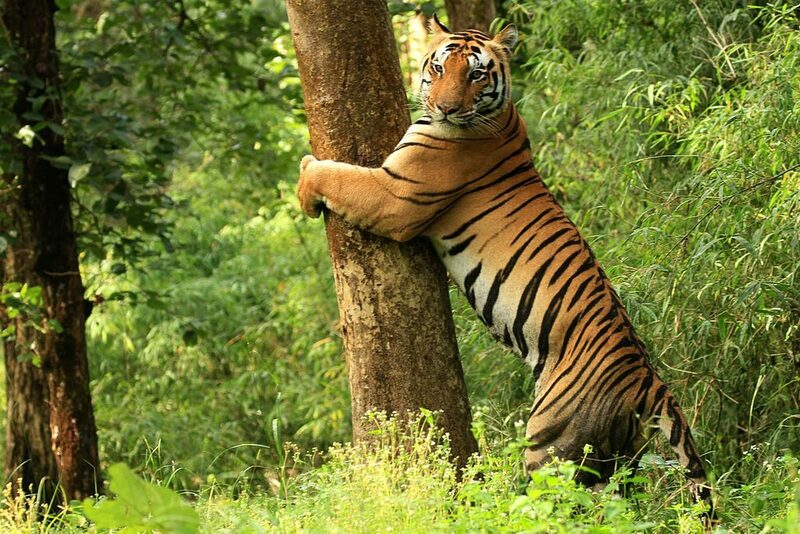 Nagarhole Tiger Reserve lies in Karnataka and spreads towards the state of Kerala. It is located to the north-west of Bandipur National Park. It is a world heritage site recognized by UNESCO and is also called the Rajiv Gandhi National Park. The Park was conceptualized as a Wildlife Sanctuary in 1955 and later converted to a National Park. The year 1999 brought it the recognition of being a ‘Tiger Reserve’. 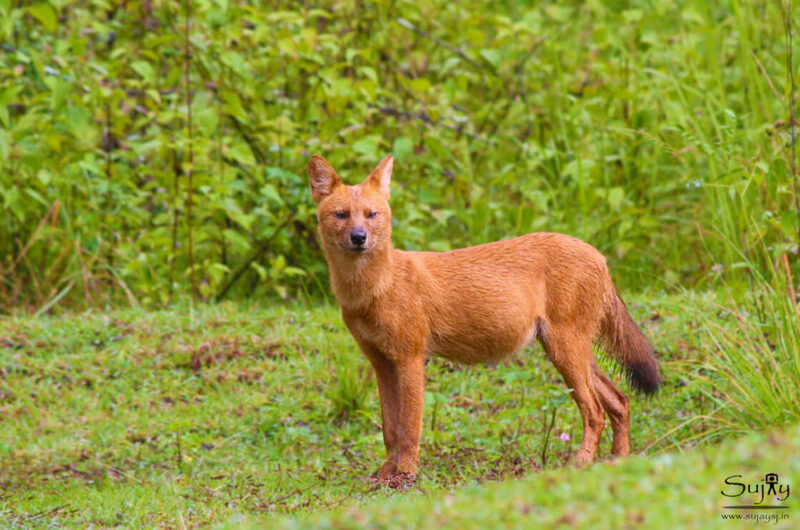 It protects the wildlife of Karnataka. Unfortunately, the Jeep safari services were cancelled since the beginning of 2016 However, the Safari experience can still be enjoyed through the Canter Safari available at Damankatte Gate. The Park conducts both Road and Boat Safaris twice a day. 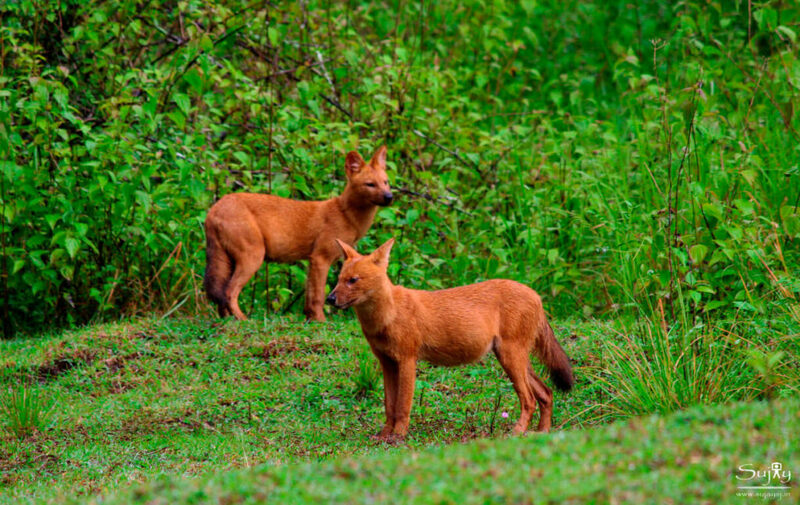 Nagarhole Reserve has a large legion of wildlife to boast about. With 270 species of birds, 96 beetles species, 60 species of ants and multitude of mammals; the Park is a lifetime treat of amazement-inducing memories. Located amidst the breathtaking beauty of the Vindhya Hills, Bandhavgarh is the pride of Madhya Pradesh. The Bandhavgarh Tiger Reserve is spread over a core area of 105 square kilometers. The buffer zone stretching over 400 square kilometers covers forest areas of Umaria and Katni. The park is popular for its Royal Bengal Tigers. It has the highest density of tiger population in the country. Also, it is home to the rare sight of White Tigers. The Tala zone, one of the three that the park is divided into, offers best tiger sighting opportunities. No wonder it attracts the most tourists. Bandhavgarh provides excellent Jeep Safari services. Most tourists head to Tala and Magdhi zones from Gate-1 and 2 respectively since the concentration of wildlife is highest here. Jeep Safaris set out twice a day, every day. The first tour sets out early morning with sunrise; the second begins between 2 to 3 PM. These safaris are luxuriating experiences for adventure lovers. Other than the majestic tigers, Bandhavgarh has to offer more than 22 species of mammals and 250 species of birds. Leopards, Asiatic Jackal, Chinkara, Palm Squirrel are some of the well-known residents here. You can move around in the park in a motor vehicle or on elephant back. 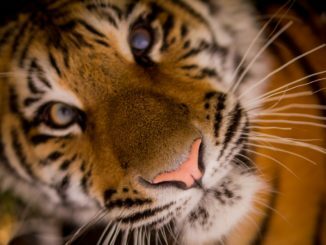 As of August 2016, there are 88 tigers in the reserve. 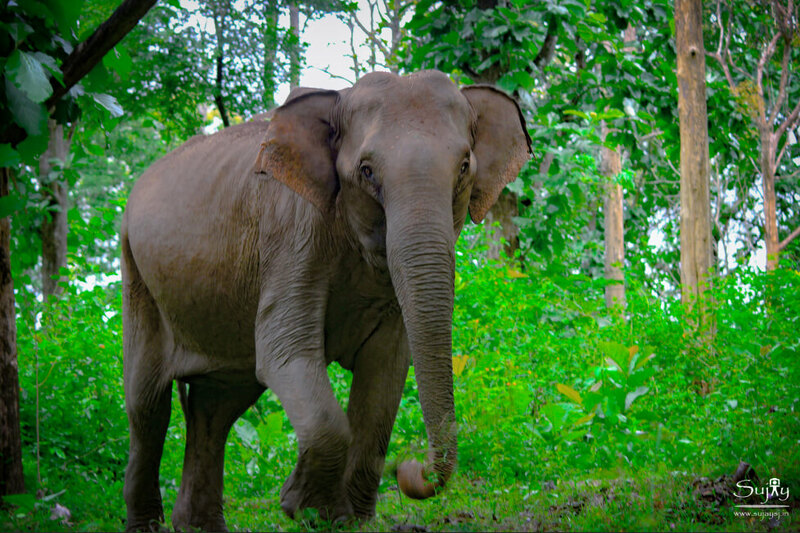 58 others dwell in the forest areas immediately outside the reserve. Light vehicles and mini jeep are permitted inside the reserve area. You must be accompanied by one of the reserve guides on your field trip. These trips are great occasions for getting acquainted with untamed wildlife and spotting magnificent tigers. 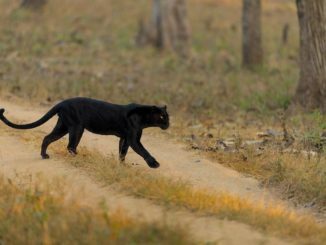 Besides tiger, the reserve is abode to several prominent wildlife species such as Wild Dog, Sloth Bear, Gaur, Barking deer, Cheetal etc. There also exists a vast diversity of bird life and vertebrate species. The tree-clad forests and rolling grasslands in the landscape offer eye-catching sights. Extending over an area of 860 square kilometres, Kaziranga sits comfortably between the beautiful Karbi Anglong hills and the splendid Brahmaputra River. It lies partly in Golaghat district and partly in Nagaon District of Assam. 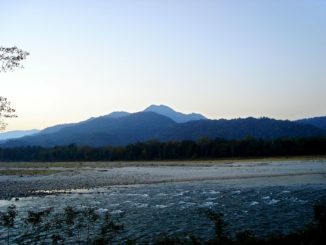 The area includes Kaziranga National Park and Burachapori within the reserve. The tea bushes surrounding the Reserve area give it unusual serenity. The tiger density in Kaziranga has been found to be 21 tigers per 100 sq. km. 2017 estimates have pointed out that there are 104 of these beasts in the reserve area. The number has considerably risen from 2014 count of 83. It is a world heritage site recognized by UNESCO. 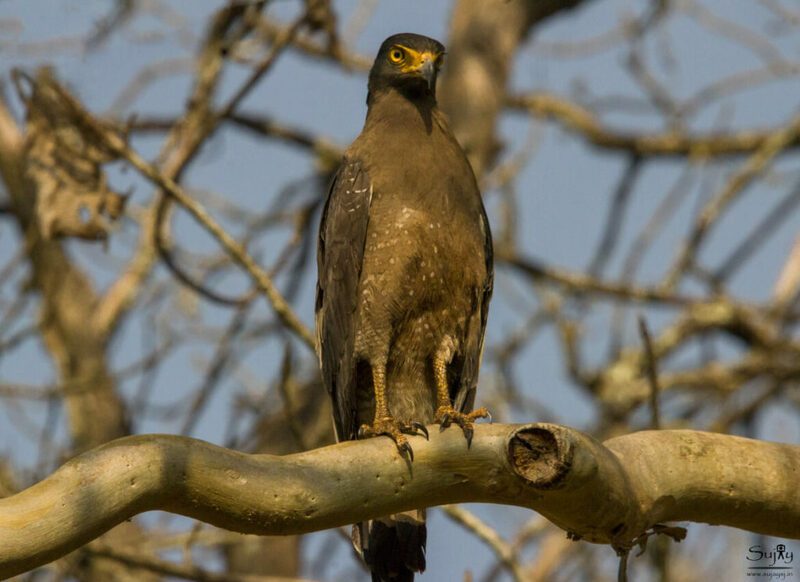 The reserve is divided into four safari zones, namely the Central or Kaziranga Range, Agartoli or Eastern Range, Bagori or Western Range and Burapahar Range. 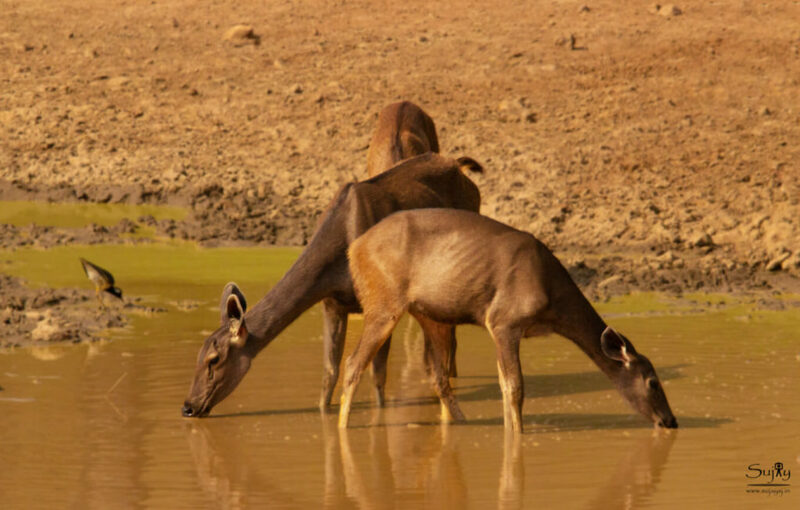 Two slots, morning and afternoon, in a day are available for Jeep Safari in all four zones. You can also tour the terrain on an Elephant Safari. Kaziranga is also abode to one-horned rhinoceros, wild buffalo, Indian elephant, pangolin, and a multitude of other species. The reserve includes plethora of varieties in turtle, crocodiles, snakes and lizard species as well. Sunderbans Tiger Reserve is located at the South-Eastern tip of 24 Paragnas districts in West Bengal. It is densely populated by mangrove forests. The trees are called ‘Sundari’ trees. Thus, giving the reserve its name. It stands over the delta formed by the Ganges, Brahmaputra and Meghna rivers. The core area of the park is covered on all sides by Matla, Haribhanga, Netidhopani and Gosba rivers. These rivers facilitate its separation from the buffer zone of 885 sq. kilometres. The reserve includes 56 islands densely covered in mangroves. The world famous Bengal Tigers are native denizens of this region. The Sunderbans is their single largest home. The number of these distinguished big cats stands at an estimated 270. Since multiple river streams run through the entire reserve, no road construction has been viable. Obviously then Jeep Safari is out of the question. But Sunderbans provide a far enriching experience through their boat safaris. These are available dusk to dawn and allow you to observe the unique landscape from a close distance. If lucky, you may even spot a swimming tiger basking in the sun. 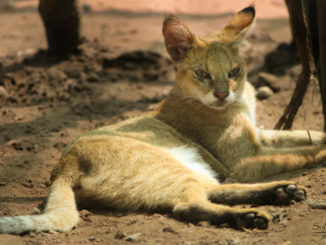 The unique geographical composition of the reserve makes it ecological and environmental amazement. It is home to 58 mammal species, 55 reptile species and 248 varieties of birds. You might want to watch out for the estuarine crocodiles on the safari. They come un-announced! The Kanha Tiger Reserve spreads over an area of 1949 sq. kilometres. This includes 250 sq. km. of Hallon Sanctuary and 300 sq. km of Banjar Sanctuary. 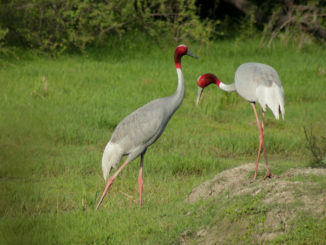 110 sq km of neighbouring Phen Sanctuary is also included in the reserve. 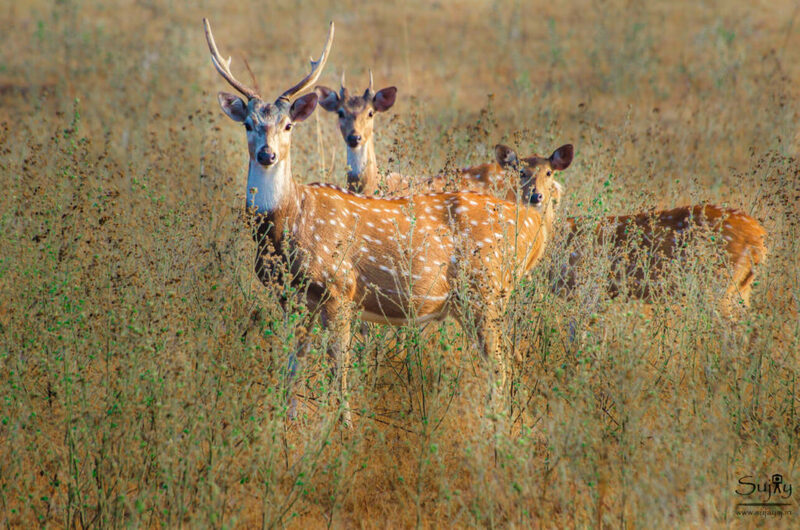 Kanha National Park was established on 1 June 1955 and made into the Kanha Tiger Reserve in 1973. 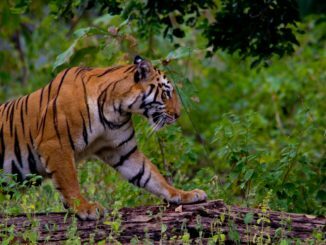 Tiger density in Kanha stands at 8 per 100 sq. km. There are at least 60 of these big cats roaming about in the picturesque landscape of the reserve. The WWF-India has put in special efforts to raise tiger population here. 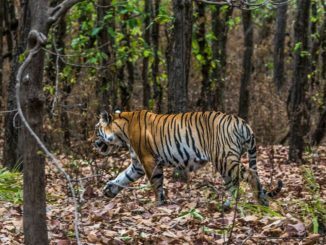 Special corridors were created on protecting tiger habitat and their prey base. You can take a good look at them from one of the Jeep Safaris available at the reserve. 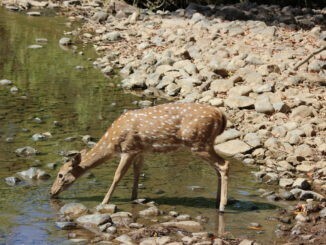 Two Safari voyages, one each in morning and afternoon, set out to discover Kanha with tourists and trained professionals. 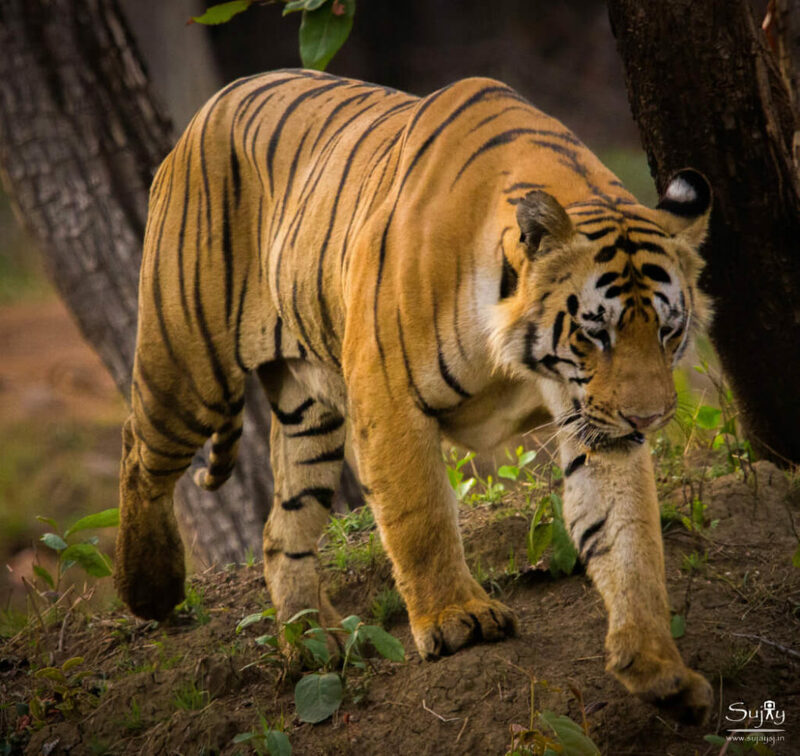 The Safari is available in each of the four zones: Kisli, Kanha, Mukki and Sarhi Zone.